Coming to Rome in May? Spring is definitely here! Flowers are blooming all over the city, and the weather is fantastic for sightseeing - warm during the day and cool at night. What to pack? What to wear in May in Rome? Is May a good time to visit Rome? What's happening in May in Rome? What are some things to do in May in Rome? I always think of May in Rome as a warm month. But the reality is that I also never change my down comforter for a lighter blanket until the end of May. And I never put away my winter clothes until then either. 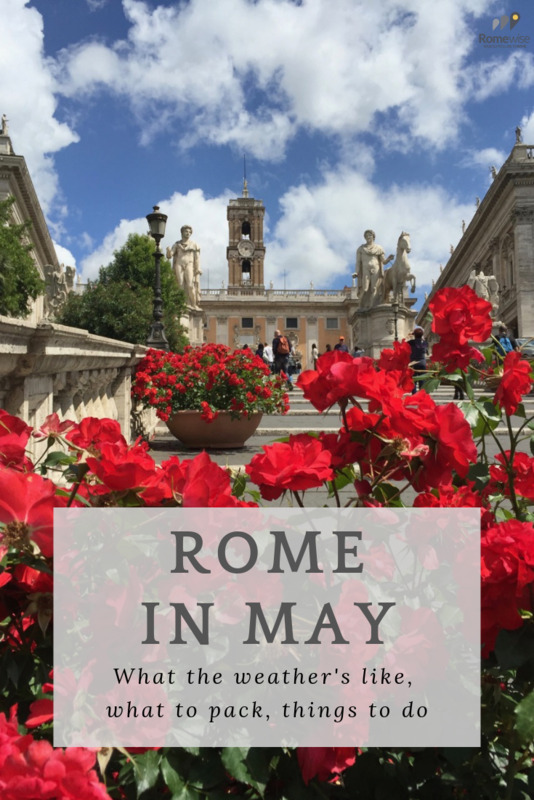 May in Rome can be cooler than you think, especially at the beginning of the month. In the beginning of May, it can still rain a bit, and temperatures are in the low 20's C / low 70's F during the day, and chilly in the evening. By the end of May, the nice weather is definitely settling in and you can count on fairly consistent long, warm sunny days and perfectly comfortable evenings. During the day it's in the mid- to high 20's C / high 70's, low 80's F, and in the evenings, it's in the high teens C / high 60's F.
If you follow me on Instagram, you know I walk around Rome a lot. I love to walk everywhere when I can, because Rome there is always something new to see. I also love looking at things I know well, like the Colosseum, and seeing it in a new light, or finding a new detail. So believe me when I tell you, I know just how to dress in Rome year-round. I say this on every page about what to wear in Rome, but it's because in Rome, you can never go wrong carrying a scarf with you. Especially in spring months. This is a good time to carry a light cotton scarf, which can warm you up on a chilly evening, or if you need to cover bare shoulders to go into a church. A maxi skirt is another good way to be cool and comfortable sight-seeing, but also appropriate for visiting churches and Christian sites like the catacombs. T-shirts are the perfect thing to pack for Rome in May, since they are short-sleeved for warm weather, but still covering your shoulders. A light cardigan is a must for travel to Rome in May, and is easily packed in your luggage but also your bag or backpack while you walk around Rome. A cotton pullover is another way to be comfortable, flexible in changing temps during the day, and appropriately dressed for sightseeing in Rome. I love my lightweight down jacket. It's perfect for fitting underneath another light outer jacket, or for bunching up and sticking in my bag or backpack. It's really ideal for sightseeing in Rome in May, when you might find yourself in an unexpectedly chilly place or realize it's cold right when the sun goes down. Another ideal spring item is this light cotton golf jacket. It's light and comfortable for chilly evenings or sightseeing in cold places (underground or inside some churches), and it's so easy to carry in your backpack. 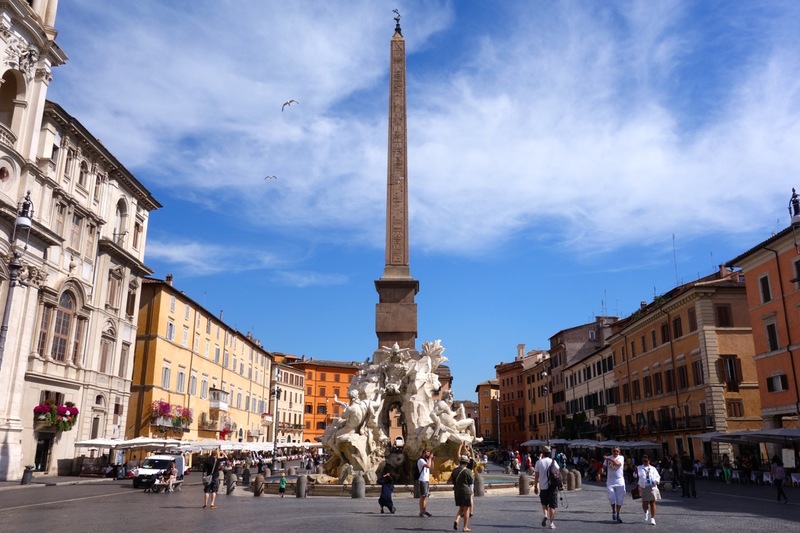 For more packing tips, and a downloadable packing list, visit my page about What to Pack for Rome. Days will usually be warm enough to wear light clothing, but you will do best to be flexible and prepared for cooler temps, in particular in the shade, on an underground visit, or as the sun goes down. As I've said on other pages, Romans don't tend to wear shorts in the city, certainly not short shorts. But if you want to, of course that is up to you. They are used to tourists doing it. But if you plan to visit any churches or other Christian site, you will not be allowed in with bare knees. Same goes for tank tops. In May, it's lovely weather and not too hot, so I'd suggest sight-seeing in cotton short-sleeved tops like tees or polos. 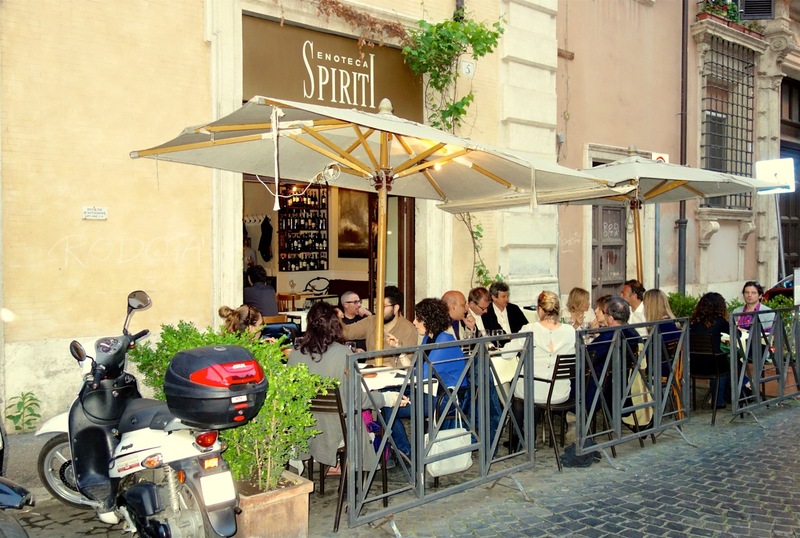 May is a lovely time to have a drink or dinner outside in Rome. Just bring a light sweater or pullover in case. In May in Rome, you may encounter some chilly mornings or evenings. Men and women should carry a light cotton scarf, and for evenings, a cardigan or pullover, or even a jeans or light leather jacket. You don't need any heavy coats or wool scarves in Rome in May. The most important thing of all is to wear comfortable shoes. Even when you have not planned a heavy sight-seeing day tromping around Ancient Rome, you will still walk a lot more than you think. And Rome's cobblestone streets are killer on your feet if you don't have sturdy enough shoes. Your best bet is to wear really good walking shoes or sandals, and skip the flip flops. Rome is absolutely beautiful in May. The days are sunny and long and there is usually not a lot of rain. And you will find the streets, plazas, restaurants and sites packed. Is it crowded in Rome in May? I'm not sure why but a lot of people seem surprised to find that May is a busy season in Rome. But for those who can pick what time of year to visit (not tied to a school calendar for example), the choice is usually spring or fall, precisely because of this nice mild weather. May is one of the best months for sight-seeing in Rome. Flowers are blooming everywhere, the days are long, and the weather is (usually) just right. The weather is not too hot and it's just perfect for sight-seeing and enjoying eating and drinking outside. You can even get in some beach time. So come and enjoy Rome in the sun and warmth, and just plan your visit to avoid crowds when you can! Artichokes are still in season but they are pretty much ending. By the time May rolls around, I find myself not eating artichokes any more. They are starting to get tougher and have more of the choke/fuzzy bits. Fava beans and peas are in season. 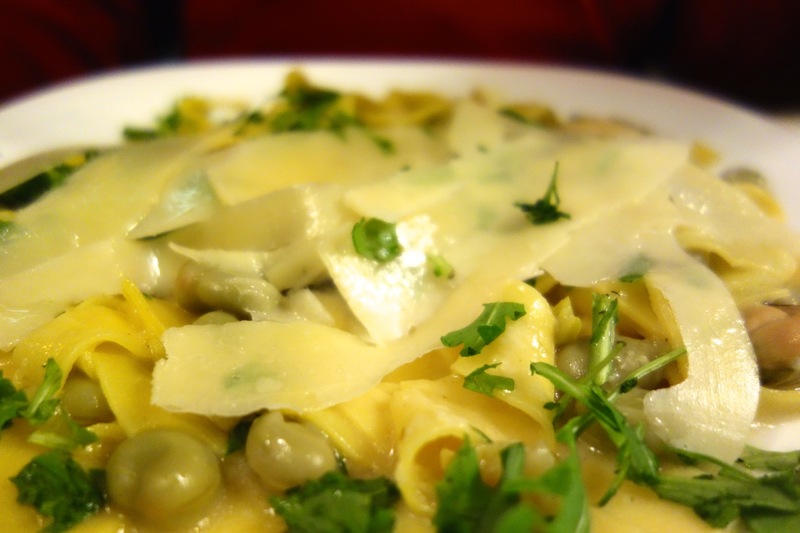 A popular thing to do in Rome on May 1 is eat fava beans with pecorino cheese. And so in Rome in May you may find pasta with mussels, fava and pecorino cheese. This is one of my favorite spring pasta dishes! Maltagliati (pasta) with mussels, fava beans and pecorino, at Suburra. A spring delicacy and I love it! May in Rome is a fantastic month for taking a food tour. Spring fruits and vegetables are also coming into season. Strawberries are easy to find, and they are deep red and really sweet. 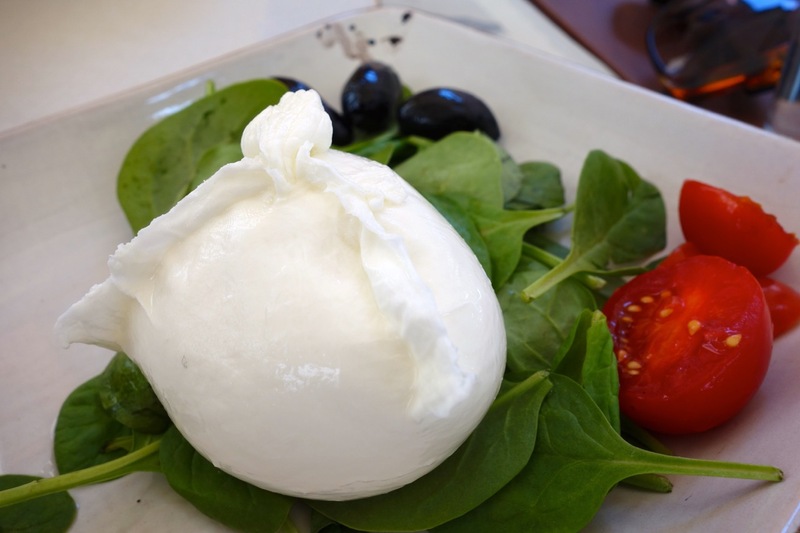 By now we are seeing all kinds of juicy tomatoes in the market and so it's a great time to start enjoying caprese salad: fresh mozzarella and tomato. May 1 is a national holiday called International Workers' Day, or May Day. It's celebrated throughout most European countries and is a kind of Labor Day. I find that Romans enjoy it more than anything as a day for a picnic or big outdoor lunch. In May 2019, many sites and monuments are OPEN on May 1! Some may close on May 2 instead. See further down the page for some exhibits you can visit on May 1. If you are not sure what to do on May 1, you can search for tours running that day. Click here. 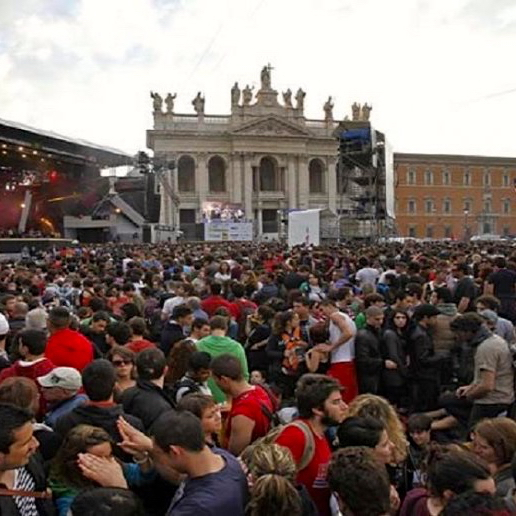 On May 1, the trade unions hold a free concert in front of the Basilica of San Giovanni. It starts around 2pm and finishes around midnight, with many local bands playing throughout. The crowd is enormous, and mostly full of twenty and thirty somethings. If you are not planning to attend the concert, I'd advise staying clear of the area for sight-seeing purposes. But May is when you will see the roses at their most beautiful and in full bloom. It's not only free, but it's usually fairly uncrowded. 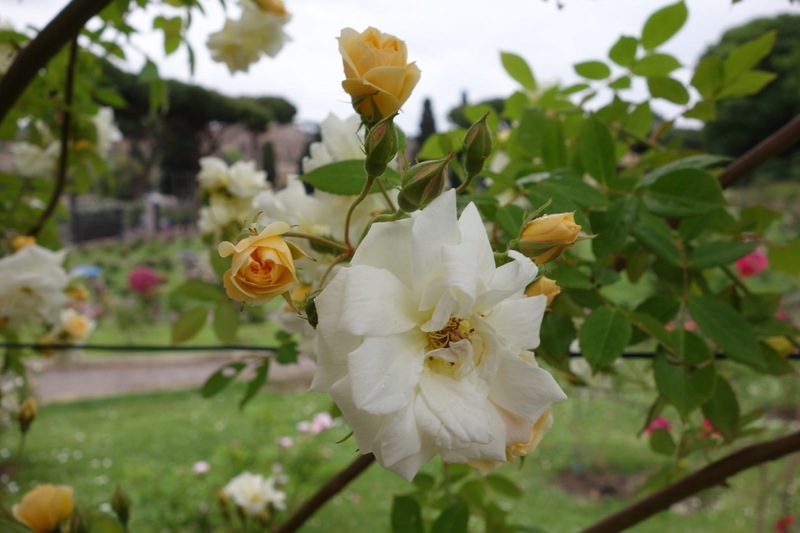 With beautiful views of the Palatine Hill as its backdrop, visiting the Roseto Rose Garden one of my favorite special things to do in Rome in May. Speaking of flowers, from mid April through early May, the Spanish Steps are covered in azaleas. It makes the Spanish Steps more beautiful than ever, and is even more special since the flowers are only there for a few weeks. Spanish Steps covered with azaleas. They are even more wonderful to see at 7:30am before the crowds arrive! The best time to see them like this without the crowds is at around 7:30 in the morning. On the last Sunday of every month, the Vatican museums are open, and free. Hours are reduced (9:30am - 2pm, with last entry at 12:30pm). Expect long lines. If you are on a budget, or have limited time, this can be a great opportunity. You cannot buy tickets in advance for the Free Sunday, but you can book a tour of the museums through the Vatican. If you don't want to book this tour, just come early. By early I mean by 8am. But otherwise I recommend you book your visit ahead of time and pay to go another day. However, there are several free dates in May. But most of the sites offer varying dates. Below, I've listed some of the most popular sites and their free dates. The Colosseum will be free on May 9, 2019, in honor of Remembrance Day for the victims of domestic and international terrorism. You can expect the Colosseum to be pretty much a mob scene. I'd highly recommend visiting one of the other sites that is also free on this day, like the Roman Forum/Palatine Hill, or Ostia Antica. Ostia Antica is also free on May 9, 2019. This is an excellent site to visit on this free day, because it's just outside of Rome and may be a little less crowded than some of the other sites. The Galleria Borghese is free on May 1 and May 8, 2019. You still need to reserve. If tickets are not available on the website try emailing or calling them. The four museums that make up the Rome National Museums, Palazzo Altemps, Diocletian Baths, Palazzo Massimo, and Crypta Balbi, will all be free on May 9, 2019. 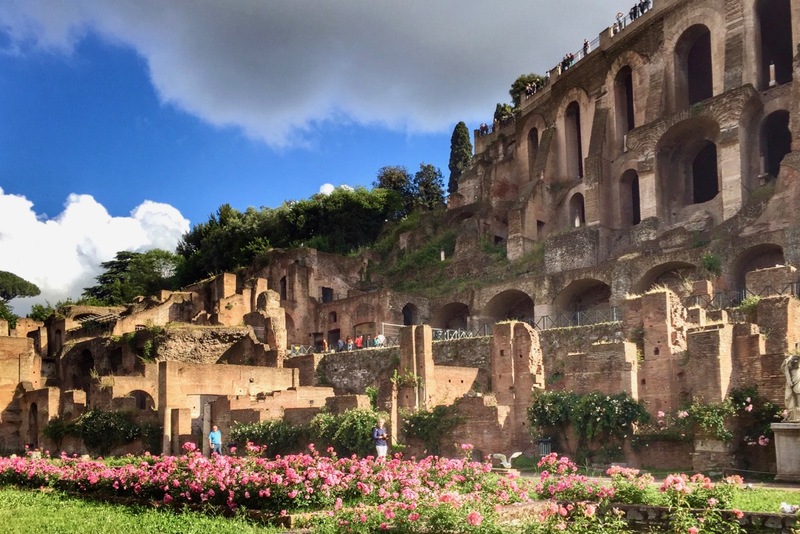 Another wonderful day trip from Rome is to visit Tivoli and see the Villa D'Este and Hadrian's Villa. Both are free on Monday May 6, 2019. One of my favorite art museums in Rome, Palazzo Barberini, will be free on May 2, 2019. They share the same management, and same schedule with Galleria Corsini (Trastevere), so you can visit that museum as well. How do I know what is free in May and when? Well, they have a new website now where you can check. And it's in Italian only. So, if you can understand Italian, or at least use a translator like Google translate, you can use this website too. Visit IoVadoAlMuseo (this means "I'm going to the museum"), and then you can either enter the specific site (in Italian), like "colosseo", or, you can enter a location, by picking from the dropdown menu. For Rome, you start with the region, which is Lazio, and then you pick the location inside the region, so Rome. Then you enter the dates, in this case 1 May - 31 May, and all the sites show up below. You have to click each one to see their free dates. In early May, you may visit hundreds of buildings, palazzos, ruins and monuments in and around Rome for free. Weekend of May 11-12 2019. The project is called Open House Roma, and includes a wide range of properties, from contemporary to ancient. The site is only in Italian, but you can see photos of the many places you can visit, and if you click on any one, it will open a map of where it is. 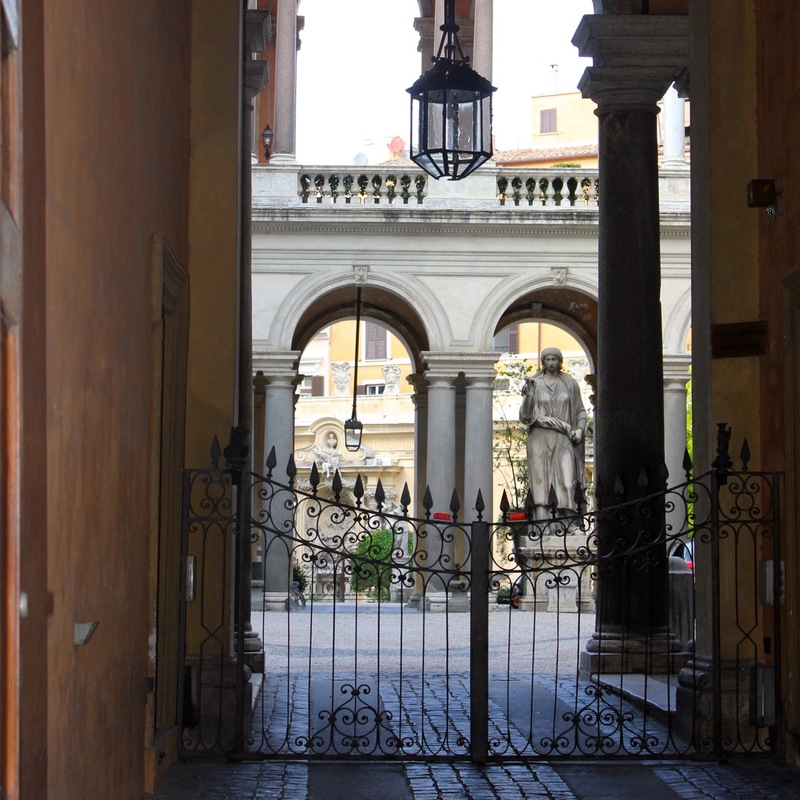 In May, the ADSI (Associazione Dimore Storiche Antiche) holds its annual "Open Courtyards" event. This means you may visit courtyards of historic palazzos and private residences not normally open to the public. It seems from their Facebook page that this will be on Sunday May 19, 2019. It's actually not easy to find out which historic buildings will be open this day, but it seems their Facebook page is the most up to date. If you are a tennis buff, you may already know that every May, the BNL Tennis championships are held at the Olympic Stadium (Foro Italico) in Rome. May 6-19, 2019. You may find more details and tickets through their website above. Every May, the Susan G. Komen Race for the Cure is held in Rome. This 4-day event begins in Circus Maximus, where there are all kinds of things to participate in, leading up to the race. The race itself is held on the morning of Sunday May 19 2019, and goes through the historic center of Rome. If you click the logo to left, it will take you to the site for the race in Rome. It's only in Italian but try translate.google.com to translate if you want to learn more about the events or to participate. The Notte dei Musei, or Night at the Museums, is a fun initiative (at many cities throughout Europe, in fact) to allow visits to museums at night, for the symbolic entry price of only 1€. On Saturday May 18, 2019, Rome civic and state museums are open from 8pm until 2am, with last entry at 1am. Museums participating include the spectacular Capitoline Museums, Ara Pacis, Trajan's Market and more (we are still waiting for the official website of the BeniCulturali to update with participating museums). The Vatican Museums are NOT included in this initiative. From April through January 6, 2020, you can visit the Colosseum at night. Entry for night visits to the Colosseum is NOT part of the Roma Pass. Now through end of October 2019, the Vatican Museums are open Friday nights from 7-11pm, last entry 9:30pm. It won't be uncrowded (although it's less crowded than during the day), but it's a magical way to spend a Friday evening. Click here to book your tour of the Vatican Museums and Sistine Chapel on Friday night. I highly recommend this wonderful laser/hologram/light show in the Forum of Augustus, that brings the whole place to life. Combine it with the light show of Julius Caesar's Forum and you will really have a sense of Ancient Rome. Various 40-minute shows from about 8pm. Get the combined ticket for both shows and save. Advance booking is strongly suggested. I have just been to the opening of this show and it's incredible! A unique mix of immersion theater, with live actors, ballet, modern dance, original music by Sting, and more. I cannot recommend this enough, especially if you are as big a fan of Michelangelo as I am. 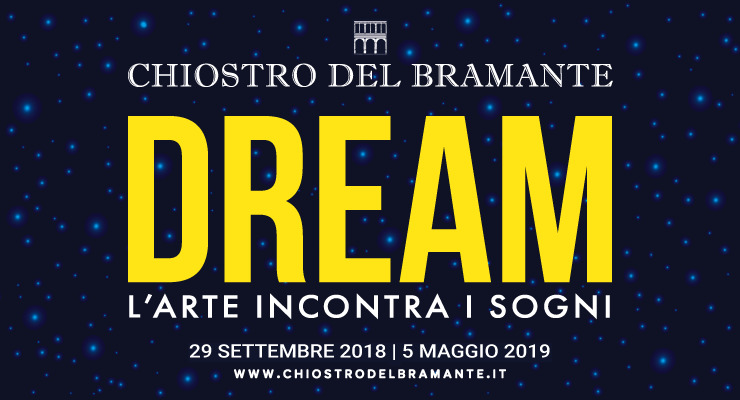 Dream - Art Meets Dreams - at the beautiful Chiostro del Bramante, until the August 25, 2019. Andy Warhol at the Complesso del Vittoriano. Until the May 5, 2019. Tickets are 13€. Advance booking highly recommended for this popular exhibit. Click the image at left to visit the official site. Pollock and the school of New York at the Complesso del Vittoriano. Until the May 5, 2019. Tickets are 15€. Advance booking highly recommended for this popular exhibit. The museum of the Ara Pacis (Augustus' Altar to Peace) is worth visiting all by itself. 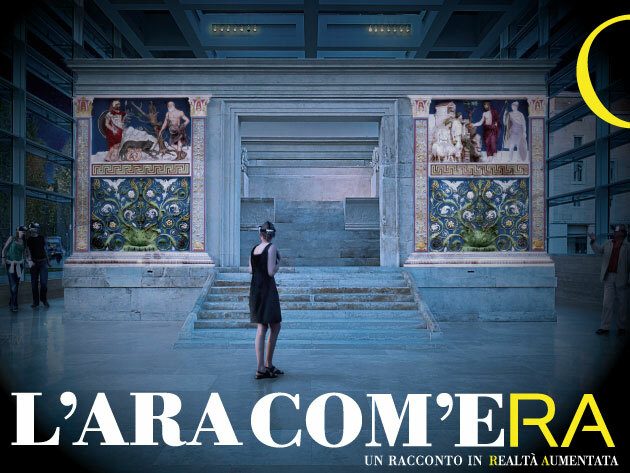 You can also visit the museum on weekend nights, and check out "L'Ara Com'Era", which means, the Altar as it Was. Using special Virtual Reality visors, you can see this amazingly intact ancient monument to Augustus, with the original colors and designs, as they probably looked 2000 years ago. Visit the website for exact hours for this exhibit as they change throughout the year. The museum is open daily from 9:30am - 7:30pm. 10,50€ for the museum, or 12€ for the weekend/night visit "L'Ara Com'Era." See the website about eligibility for discounts. Take in an opera or ballet. 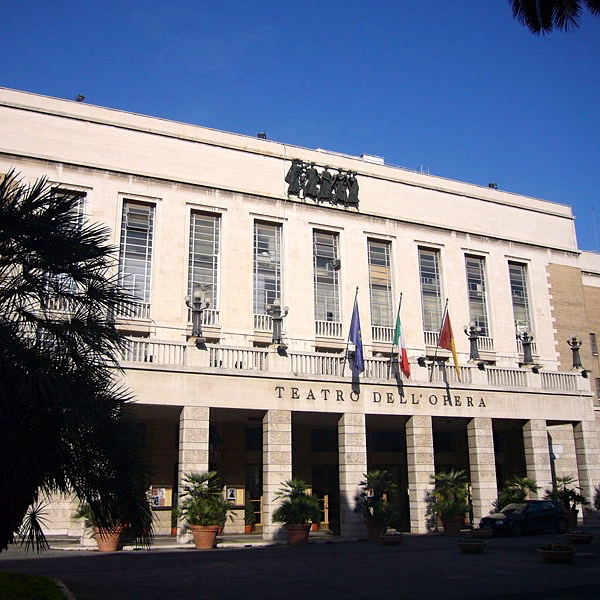 The Rome Opera House will show Sergej Prokofiev's The Fiery Angel from 23-30 May, 2019. Also, you can enjoy an evening of Ballet with music by Gustav Mahler. Enjoy a opera singing by Orchestra I Virtuosi dell’opera di Roma inside the church of St. Paul's within the Walls. These wonderful opera singers put on a mini-production of La Traviata in full costume. Immerse yourself in the art and inventions of one of history's most famous inventors and artists of all time, Leonardo da Vinci. While you tour, you'll hear music from da Vinci's time, played on historically accurate instruments. At the end, you will be treated to a live concert. Listen to classic arias and duets by Italian opera greats Verdi, Puccini, and Rossini, in the gorgeous Palazzo Doria Pamphilj. A special private tour of the Princess' apartment is included. Visit the extraordinary Capuchin Crypt, then head into the recently restored church to listen to sacred music in a gorgeous setting. 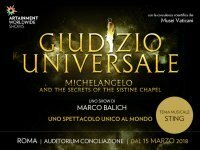 Fans of the Baroque will love this beautiful concert inside Borromini's stunning basilica on Piazza Navona. You'll be treated first to a short guided tour of this masterpiece, followed by a concert of Baroque music. Enjoy "La Traviata" experience, a mix of opera and prose. This opera compilation is set in a relaxing location inside a small church in the center of Rome. "Sounds and Visions of Caravaggio"
Experience Baroque and Renaissance chamber music in the gorgeous setting of Palazzo Doria Pamphilj. Your ticket includes a guided tour of the palazzo before the show. Enjoy beautiful Vivaldi music in the lovely setting of the Palazzo Doria Pamphilj. Tour the private apartments of the Princess Doria Pamphilj. Enjoy private access to one of Rome's most exclusive rooftops right on Piazza Navona, while sipping your aperitivo and listening to Italian opera classics from Verdi, Rossini, and Puccini. Take in a concert by Enrique Iglesias. Buy tickets here. From 49€. Enjoy a tribute to one of Italy's most famous composers, Ennio Morricone. Buy tickets here. From 25€. From spring, Rome's Casa del Jazz will have concerts throughout the season. Click here to visit TicketOne where you can see the schedule and buy tickets. I've listed some of what I think are the most fascinating events in Rome in May, and most central. 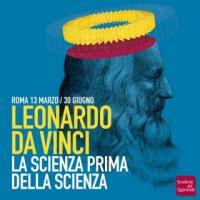 For a complete list of events in Rome in May, visit the website of the Rome Tourist Board. Get the Rome in May e-book today, and take it with you, even offline!